The Gedenkstätte Museum in der “Runden Ecke”, to give it its full official name, is primarily an exhibition about the Stasi, the infamous former secret police in East Germany, the GDR. The German name of this Leipzig institution translates roughly as 'memorial museum in the “round corner”'. The latter is a reference to the curved shape of the corner of the building where the main entrance is. More background info: The building with its characteristic rounded corner that gave it its nickname was originally constructed for an insurance company in the early 20th century, in the then still popular historicist or “Gründerzeit” style. For a brief period immediately after WWII it was used by the American occupying forces as the regional seat of their military administration before Leipzig was handed over to the Soviets in July 1945, who also took over the administration building. When eventually change was coming in the GDR in 1989, the dreaded “Runde Ecke” gradually turned from a source of fear to a target of protests. On 9 October the first real mass rally of the evolving Monday Demonstrations saw 70,000 participants marching right past the “Runde Ecke” Stasi HQ. Despite thousands of soldiers and police forces mobilized that day to intervene, no order to do so was given. The demonstration passed without any violence. The feared “Chinese solution” (an allusion to the Tiananmen Square massacre in Beijing just months earlier) did not happen. It was a turning point. The next mass demonstration in Leipzig saw an increase to 120,000 protesters, a week later over 300,000 turned out, a week after that about half a million. The revolution had gained an unstoppable momentum. Then the Berlin Wall “fell”on 9 November. The dam had burst, so to speak. The regime had lost control and was collapsing. As the implosion of the GDR institutions was accelerating, protesters entered the Leipzig Stasi HQ at the “Runde Ecke” on 4 December and occupied it, primarily in order to stop the destruction of files. Realizing that their time was up and panicking about all the evidence kept in their files, the Stasi had begun to systematically feed the files into shredders. The occupation of the “Runde Ecke” put a stop to that, at least here. (However, similar action to stop the destruction of evidence also took place in other Stasi centres across the country – see e.g. Normannenstraße, Berlin, or Bautzner Straße, Dresden). 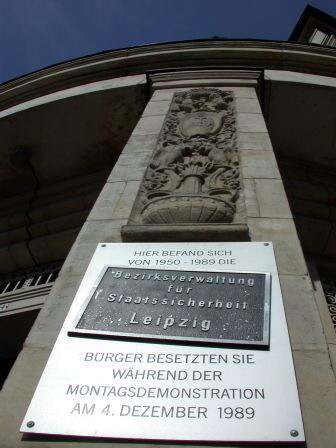 The same night that the protesters took hold of the Stasi HQ in Leipzig, the “Bürgerkomitee Leipzig”, the 'citizens committee of Leipzig', was founded, with the mission to safeguard the evidence. The committee was later also involved in the drafting of a federal law on how to deal with the Stasi files henceforth (“Stasi-Unterlagengesetz”). As early as June 1990, the committee also put together a first exhibition about the deeds of the Stasi, and entitled it “Stasi – Macht und Banalität” ('Stasi – Power and Banality'). Initially this was an open-air exhibition. But after it had drawn large numbers of visitors, it was decided to give the exhibition a permanent home – namely right inside the former Stasi HQ “Runde Ecke”. It was opened in August 1990. The exhibition has evolved somewhat since then, though many of the original texts and labels are still part of it, and the name was kept too. Apparently the curators of the exhibition are under a bit of pressure from the federal authorities to “modernize”. Many other places of commemoration in Germany have indeed seen major re-working in recent years, not least at the Stasi Museum in Berlin (which is quite probably THE most significant site connected to this topic). Personally, though, I hope the “Runde Ecke” can at least to some degree resist being brought “in line”, as it were. True, the exhibition does have a certain “old-fashioned-ness” and “home-made-ness” about it, but that's arguably part of its charm. I hope this authenticity won't be marred by the pressure to introduce too much “state-of-the-art” museum technology such as multimedia stations and interactive flatscreens, which are currently so all the rage. The exhibition occupies only part of the ground floor of the building it is in. 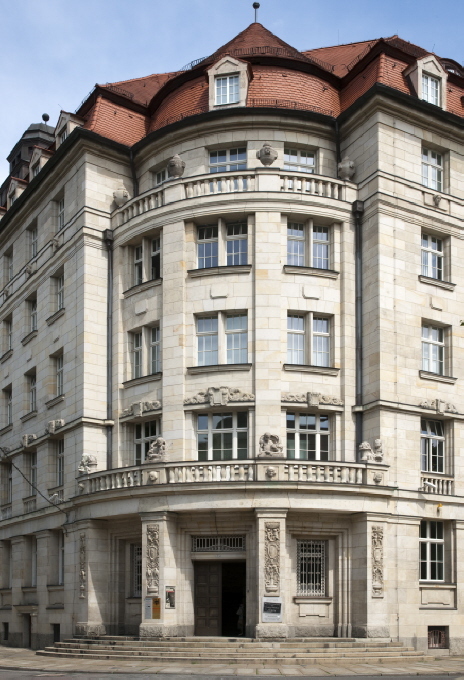 Much of the rest of the building is now used by the Leipzig branch of the BStU – the Federal Stasi Records Agency that is in charge of sorting and archiving the files left behind by the Stasi. Citizens who want to know if the Stasi had kept a file on them can enquire about this here, and if there is one they can gain access to their file and read it. What there is to see: First things first: the exhibition as such, all its texts and labellings, is entirely in German only. So if you do not have a decent enough grasp of the language, you'll need to grab an audio-guide, and fortunately these are available (for a 5 EUR fee) in a range of languages, including English, of course (and also French, Spanish, Italian, Dutch and Polish). These are NOT handed out at the entrance, though. You have to first proceed to Room 37, which also serves as the museum shop, and then return to the start of the exhibition. I did not use such an audio-guide when I visited (in April 2017) so I can't say anything about their quality. But I saw quite a number of other visitors looking pretty engrossed in what they were hearing. As you enter the dark-marble-clad entrance hall a large banner on the opposite wall is the first big original exhibit to strike you. It proclaims the mission of the occupiers of the building of 4 December (see above). Several text-and-photo panels to the side of the entrance provide a brief account of the Monday Demonstrations and the course of the Peaceful Revolution in general. The rest of the exhibition is spread over several rooms – all originally used by the Stasi. The flooring and the curtains are still authentic (and, some say, so is the characteristic Stasi office smell), but the typical wallpaper has gone. The walls are now whitewashed. (And one member of the committee's team confided to me that they now somewhat regret not having kept the awful wallpaper too). Thematically, there are different sections on different topical aspects of the Stasi, the GDR and citizens' resistance. Without going into too much detail: this includes an overview of the underlying ideology, how the Stasi recruited members, and of course their various methods of surveillance and repression. Particular highlights involve remarkable artefacts, e.g. the elaborate machinery devised (and used en masse) to open or X-ray letters and parcels. Audiovisual surveillance is also represented, including cameras and TV monitors as well as a mountain of cassette tapes used for secretly recording telephone conversations! Especially unbelievable, and hence awkwardly fascinating at the same time, is the section about “masquerading” – i.e. how Stasi members were trained to dress up and make up as, say, a builder, or an Arab, or whatever was needed for “undercover” observation operations. They were even trained to make their own false beards and such things! The story of the scent samples is also one of the most intriguing and appalling parts of the Stasi legacy. What they did was this: for interrogation they sat “suspects” on chairs which had been prepared with a yellow cloth secretly placed under the outer upholstery. Interrogation is of course a situation in which anybody is prone to some perspiration. That way they obtained the scent of the “suspects” in case they ever had to track them down again at a later stage using sniffer dogs. For that eventuality the yellow cloths were archived in sealed glass jars. Several of these jars are on display at this exhibition. On display too are all manner of bugs, surveillance cameras and such things. Also covered is the symbolism of the Stasi, the SED party, the FDJ (youth organization) and the GDR in general. Some remarkable artefacts here include a fluffy Stasi-symbol wall rug that could just as well have been something you'd want in front of your loo. The degree of “kitschiness” is often amazing to behold. Some of the GDR-symbolic items on display here are not historic but more recent and intended to illustrate the delicate issue of “Ostalgie” (nostalgia for the past in the GDR). 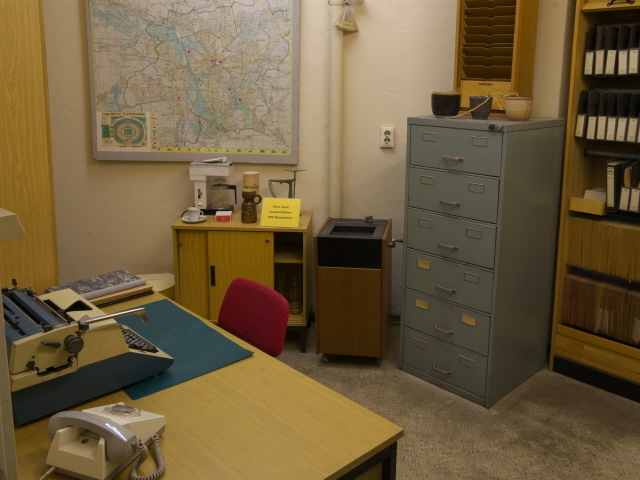 Some rooms are whole ensembles, such as a fully preserved original office of a regular Stasi employee. The stuffiness of this small space seems so at odds with the degree of repression and power wielded from such places. But that's also part of that so unsettling Stasi “aura”. One room is not authentic but a reconstruction, namely of a prison cell from Leipzig's local Stasi remand prison. The original building could not be preserved (instead it underwent conversion after the end of the GDR – unlike in Dresden, Berlin Hohenschönhausen, Potsdam or Bautzen). But at least the artefacts used in this reconstruction could be salvaged. This also applies to the photography and prisoner registration room next door. All in all, what's most impressive about this exhibition is a) the many authentic artefacts to be seen, and b) the authenticity of the exhibition commodification itself, which was made by the revolutionaries themselves and largely dates back to the days immediately after the fall of the Berlin Wall and German reunification and thus conveys some of the charged atmosphere of those days quite authentically as well. The latter is something that the more polished, modern and “multimediafied” exhibitions elsewhere cannot compete with. So it's well worth going to Leipzig to see the Runde Ecke, even if you've already been to, say, the main Stasi Museum in Berlin. Location: in the centre of Leipzig, right on the western side of the ring-road around the Old Town heart of the city, address: Dittrichring 24. Access and costs: easy to get to, free (but donations welcome). Details: Very easy to find: from the central part of Leipzig you just have to head west to the ring and follow it up till you get to the unmissable imposing building forcing the ring to bend around it. The central market square is just minutes away (500 m), even from the central train station it is only a good 10-minute walk (1 km). Opening times: daily from 10 a.m. to 6 p.m. Admission free, nominally, but donations are very welcome! Audio-guide: 5 EUR (German, English, French, Spanish, Polish, Italian, Dutch). Guided tours (in German, one hour) take place daily at 3 p.m. and also cost 5 EUR per person. Time required: one to two hours – if you want to read absolutely everything there is, then possibly even longer. Combinations with other dark destinations: in general see under Leipzig. Right next door, in the former cinema room of the Stasi, which is still in the same building complex but has a separate entrance, is another exhibition with a stronger focus on the Peaceful Revolution in East Germany (and not so much on the GDR and the Stasi as such). Originally intended as a temporary exhibition on the occasion of the 25th anniversary of the revolution, this has now been in place for quite a while and I was told at the “Runde Ecke” that it will probably become a permanent fixture. A bit further away the Runde Ecke committee is also involved in preserving and commodifying an especially sinister site: the GDR-era execution site at the prison at Alfred-Kästner-Straße. 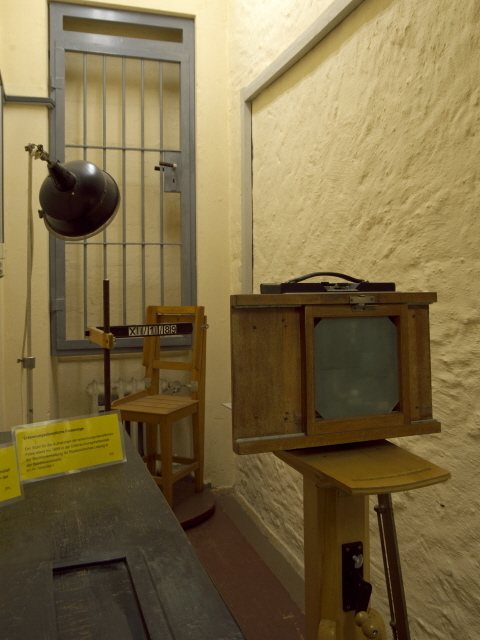 This was used between 1960 and 1981 and over 60 victims of such executions (often the result of sentences that came about under legally dubious circumstances) are known. The site is currently accessible only on special days (e.g. the Leipzig Museum Night), but there are plans in the making to turn this into a more regularly visitable memorial. One site also under the aegis of the Runde Ecke and its citizens committee but actually outside of Leipzig, yet somewhat more regularly accessible, is the former Stasi bunker in Machern. Moreover, the Runde Ecke organizes guided walking tours of Leipzig that take in various historic spots related to the Peaceful Revolution. Regular tours (in German) take place every Saturday from 2 p.m. and cost 5 EUR per person; meeting point is the main portal of the Nikolaikirche (St Nicholas church) in the heart of the Old Town of Leipzig. Smart-phone users can also go independently by using a special multi-media app called “Leipzig '89” that you can download for free (for both of the big stores, the one with the small <i> or the Big G). Back at the Runde Ecke also take note of the small memorial plaque to the right of the main entrance that commemorates the liberation of Leipzig by US troops in April 1945 (see under Leipzig >background). Combinations with non-dark destinations: see under Leipzig.